Highway Entertainment is now selling premium China made metal and plastic cabinets. The machines feature a 32 inch LCD screen and are available in both horizontal and vertical orientation. 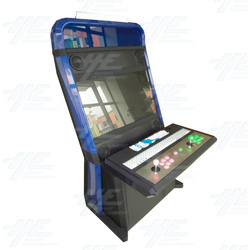 They are twin player machines with 6 buttons per player. These premium cabinets are available in blue, white and red. Please note that if ordered in container quantities the colour of these machines can be customized. Your company logo can also be featured. For images of the Premium LCD cabinet, please see here. Please contact our sales team for pricing and additional information.